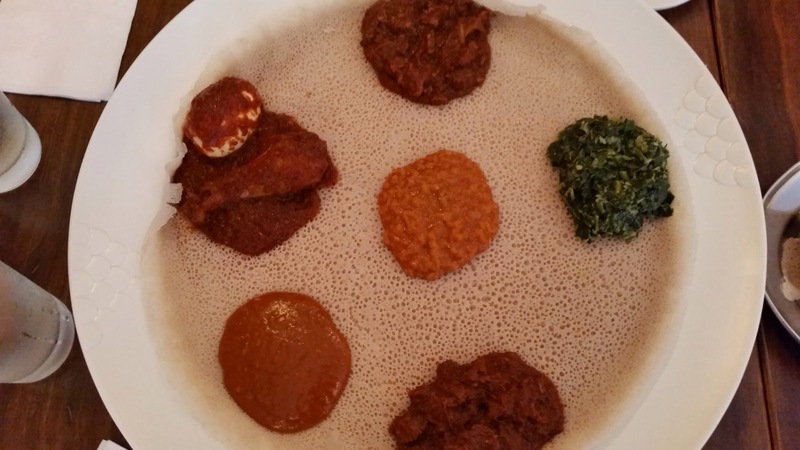 Wanderlust – A Very Late Lunch at Dukem Ethiopian Restaurant in Washington D.C.
D.C. is well-known for the Ethiopian cuisine. I have tried multiple Ethiopian restaurants in the past but today I sought out a long-term former D.C. resident to give me a solid recommendation. My Eritrean friend, Moses (or Musie in Eritrean), recommended Dukem on U Street. Who would know Ethiopian food better than an Eritrean? I ordered the Vegetable Combo and Fish. Came with spicy splint lentil, yellow peas, greens, cabbage, and salad. Obvious, it also included the fish. I over-ordered by a lot for a one-person lunch. So all I could muster was the fish. The fried fish was so crunchy and yummy it reminded me the red snapper my mom used to make for me as an after school snack back in Taiwan. Needless to say, this was an outstanding food experience. The restaurant is not much to look at, the table-cloth simple and plastic. But the food was superb. I will be having the delicious veggie left-overs tonight at wherever I am going. Thank you, Moses or Musie! My wanderlust weekend continues. Follow me at Mobilytrip.com. 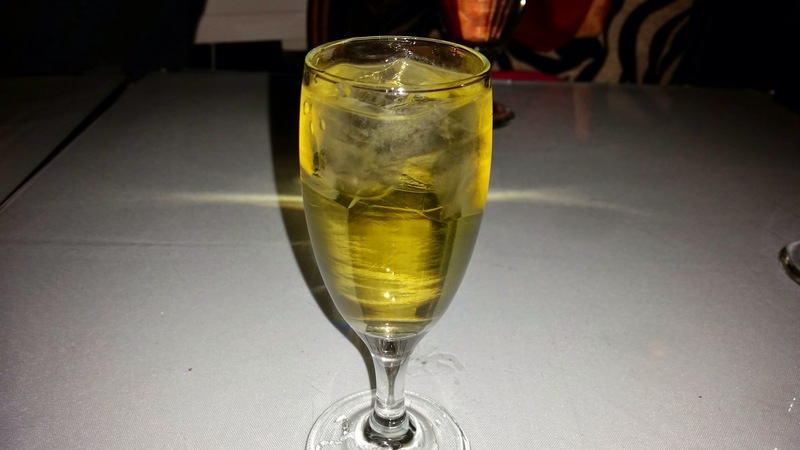 Posted on April 3, 2015 April 6, 2015 Categories Cuisines, Ethiopian, My Travels, WanderlustTags DC Ethiopian restaurants, Dukem DC, Dukem Ethiopian Restaurant, Ethiopian food, ethiopian fried fish, Peilin Corbanese, Peilin Corbanese Travel, Peilin Corbanese Wanderlust, Wanderlust3 Comments on Wanderlust – A Very Late Lunch at Dukem Ethiopian Restaurant in Washington D.C. In full disclosure, I am a regular at Lalibella Ethiopian restaurant in Mount Kisco, NY. Have I told you how much I like Ethiopian food? Have I told you that Ethiopian food almost made the list on my last supper request? I have been going to Lalibela since it opened back in 2010. The food is finger licking good and delicious! The spices especially the cardamom, the berbere, the turmeric, the use of the clarified butter and the unleavened bread of injera are just some of the reasons why I love this cuisine. There are a lot of vegetarian dishes: lentils and different kind of dark greens and beets. 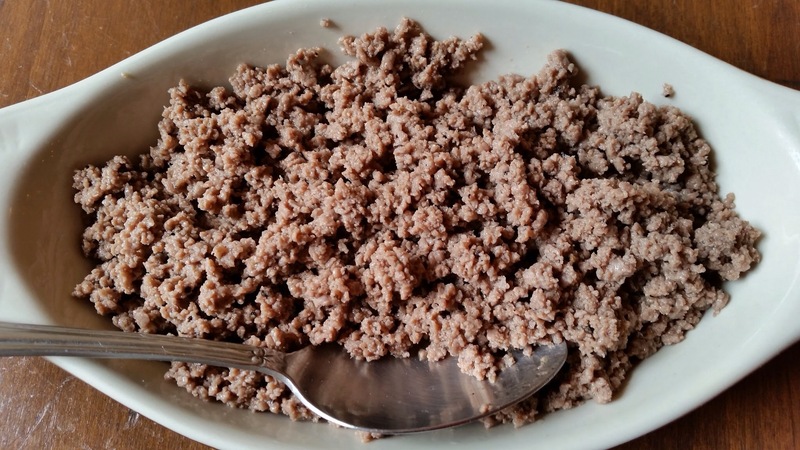 Proteins are also used but to a lesser degree than the vegetables. 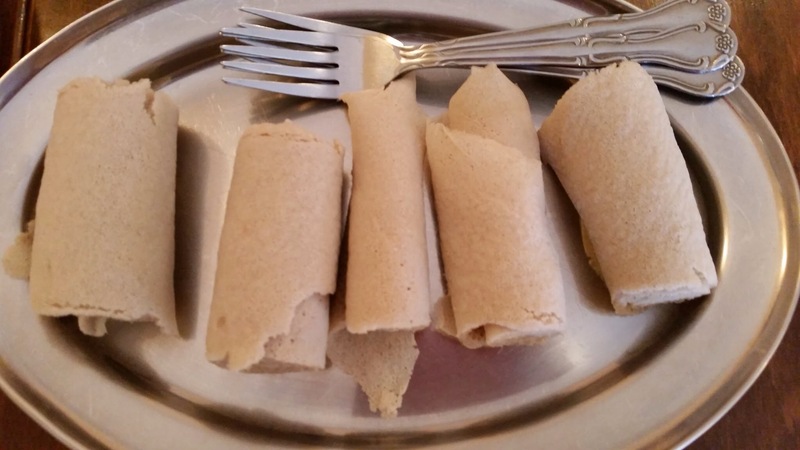 This is injera, torn up and rolled. I would come just to have injera. The bread itself is a little sour, soft and spongy. This is an acquired taste and it is excellent. You must try it! The proper way of eating Ethiopian food is to tear up a small piece of the injera, use it to pick up the sauce, vegetables, or proteins. Although forks are shown here, we don’t use them. We use fingers on the right hand to pick up our food. Here is the Taste of Lalibela, a combination of Siga wat (stewed beef), Yebag wat (stewed lamb), Doro wat (stewed chicken leg with an egg) and three vegetarian dishes of our choice. In this case, we chose Shiro wat (split peas), Gomen (collard green), Misir wat alichan (non spicy split lentil). From 12 o’clock counter clock wise, we have Yebag wat, Gomen, Siga wat, Shiro wat, Doro wat. In the center is the Misir wat alichan. 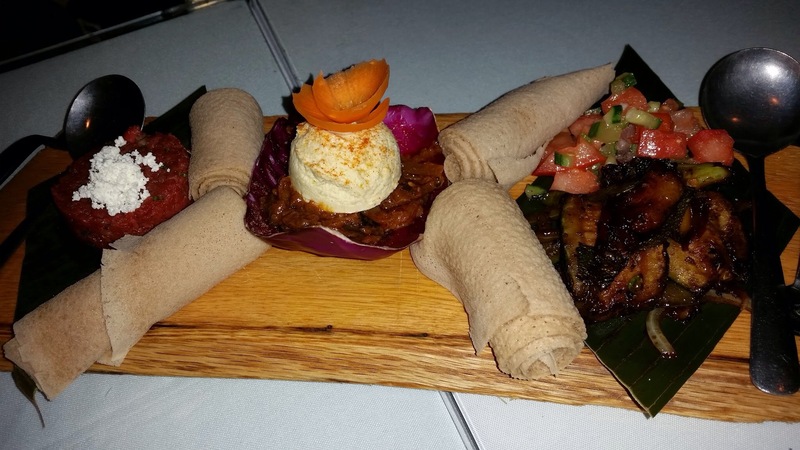 This is a very nice combination of different popular Ethiopian dishes. This is Kitfo (steak tartar), ground beef cooked to perfection with Ethiopian spices. This is my go to. I think of it as my Ethiopian hamburger without the buns. Much more tasty than the traditional burger. Not pictured here is the Ethiopian coffee/espresso. Ethiopian coffee is an experience deserving of a solid long post. I love freshly brewed Ethiopian coffee. Slight detour from Ethiopian: The freshly brewed Moroccan mint tea, served in the traditional way, has the same high regard as the Ethiopian coffee in my heart. 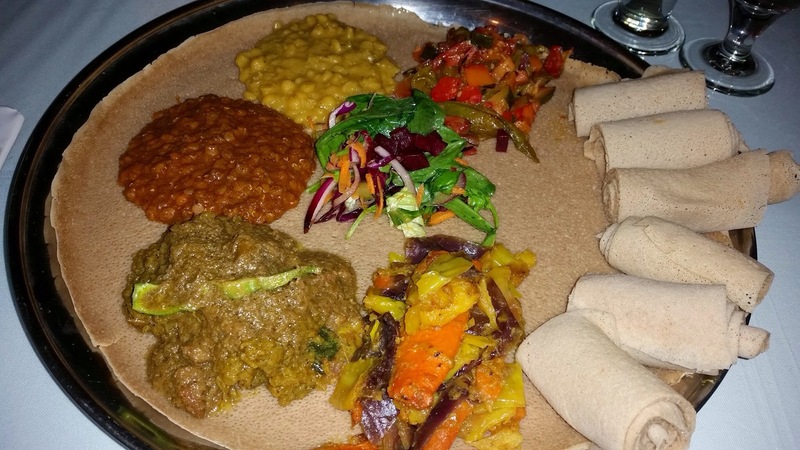 Overall, I love Ethiopian cuisine and I always seek out Ethiopian restaurants in any cities I visit. Specifically, Lalibela is an Ethiopian restaurant that I love to frequent. I highly recommend it. XOXO.